Comprising only 1% to 1.25% of the entire 880-pound weight of an average pasture-raised cow, the beef tenderloin is the most tender muscle available and is one of the most desired and expensive cuts of meat available on the market. Located on the hindquarter, opposite the New York strip separated by the spine, the tenderloin has a low fat content and superior tenderness. It can be grilled or pan-broiled to perfect, melt-in-the-mouth doneness. 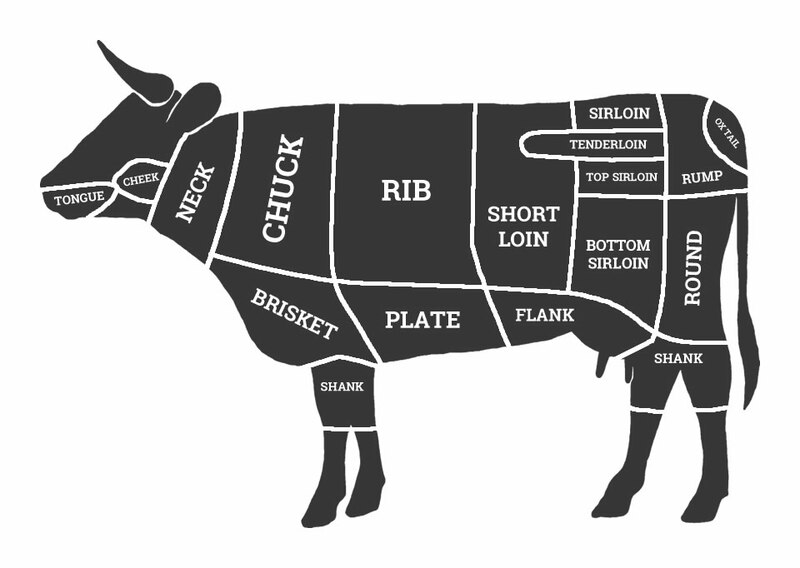 Because of its scarcity and cost, we at Foothills Meats have it available at our meat counters but we encourage you to call ahead for availability! We also may include it from time to time in our Butcher's Choice Box subscription or in our Tier 2 Grill Box. We can also suggest similar cuts for your meal needs. In the meantime, here are two recipes that will help you perfectly prepare beef tenderloin or filet mignon. Enjoy! Trim excess fat with sharp knife, and fold thin tip under until both ends are approximately the same thickness. Bind with butcher’s twine every 1.5 to 2 inches. This helps the meat keep its shape. Snip silverskin with scissors to keep roast from bowing during cooking. Mix oil, garlic, rosemary, thyme, pepper, and salt into a rub, and thoroughly coat meat. Heat grill to high temperature, then lubricate grate with oil. The easiest way is an oil-coated rag and a pair of tongs. Do not oil grate before heating, as oil can potentially catch fire at high heat. Place beef on hot rack and close lid. Grill until well-seared, about 5 minutes. Turn meat and sear another 5 minutes. Move meat to cool side of charcoal grill, or on a gas grill, turn burners off beneath the meat and reduce two burners on each side of meat (depending on style of grill) to medium heat. Cook until meat thermometer in thickest portion of meat reads 130 degrees F (54 degrees C), giving a rosy pink center, between 45-60 minutes depending on meat size and grill. Remove from heat and let rest 15 minutes before carving. Season both sides of steaks with salt and pepper to taste. Heat a non-stick skillet to medium-high. Place steaks in hot pan to sear, 1 minute on each side or until browned. Reduce heat to medium-low and pour balsamic vinegar and dry red wine over steaks. Cover and cook for 4 minutes each side, basting meat with glaze when turning. Cook to rosy pink center, 130 degrees F (54 degrees C) via meat thermometer. Remove from heat to two warmed plates and spoon a tablespoon of balsamic glaze over steaks. Serve immediately.